Just like how I developed a liking for the taste of dark chocolate after my milk-chocolate-obsessed childhood, I developed a liking love for cheesecake. I used to hate the creamy texture and the tangy flavor of cheesecake, I preferred all things baked such as cakes, cupcakes and cookies... I also preferred all things chocolate. But I've changed and for the better. 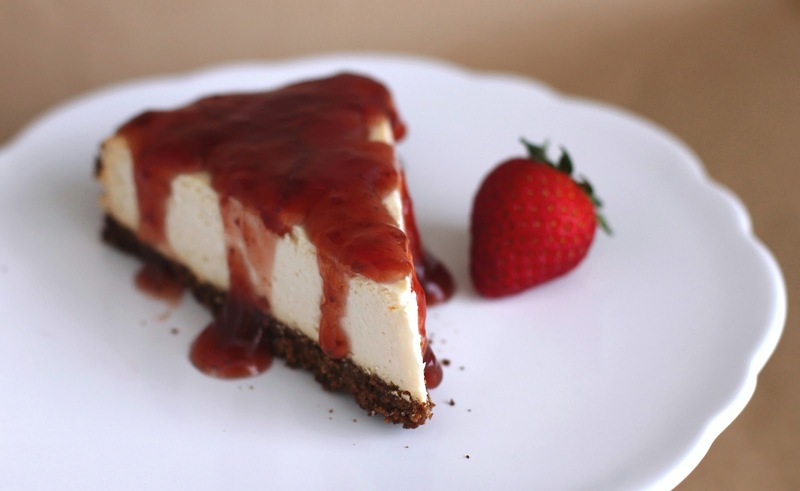 I crave cheesecake just like I crave cake. Probably because now I know that cheesecake can actually be a healthy, balanced dessert that also tastes good! Scratch that. I am so pleased with the result of this dessert, and apparently so is everyone else I shared it with! Two bites later, I regretted sharing it at all... because I kinda wanted it all to myself. 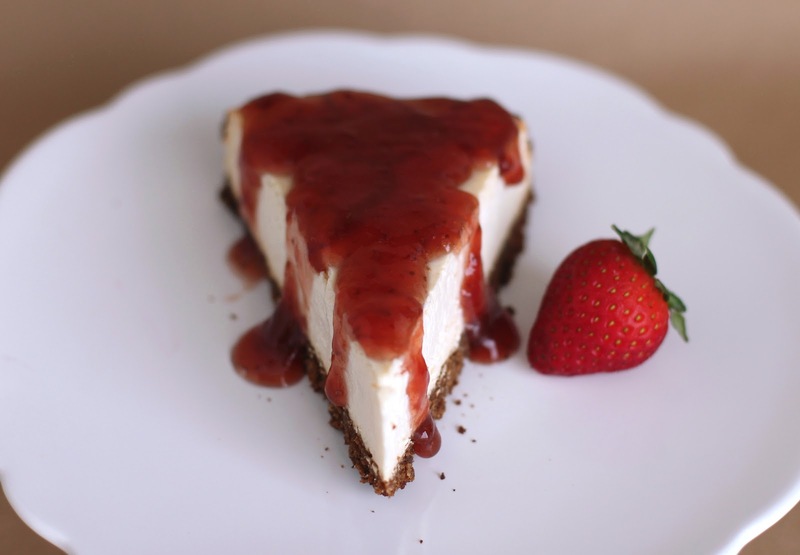 Everything a cheesecake should have! *If you like a thin crust, use 1 cup of crumbs and 3 tbs of coconut oil. 1. Preheat the oven to 350 degrees Fahrenheit and spray a 9" springform pan with cooking spray, set aside. 2. In a blender or food processor, crush the crackers until they are crumbs. Pour into a medium-sized bowl and whisk in the sugar and salt. 3. In a small bowl, combine the coconut oil and butter extract, stir, then pour over the graham cracker mixture. Stir until all mixture has been moistened then pour into the springform pan. Flatten the mixture, raising the crust slightly around the edges. Bake for ~8 minutes, until fragrant. Let cool while you make the filling. 1. In a large mixing bowl, add the cream cheese, yogurt, agave and extracts, and whisk until almost all is combined (it should be slightly clumpy). 2. Whisk in the protein powder, then whisk in the starch (mixture should be smooth now). Pour into the springform pan and bake for 32-35 minutes (surface should be somewhat firm and have cracks, but don't worry, it will be covered with the jam! Edges should be slightly browned, not burnt. Depending on your oven, a few more/less minutes will be needed to just keep watch). 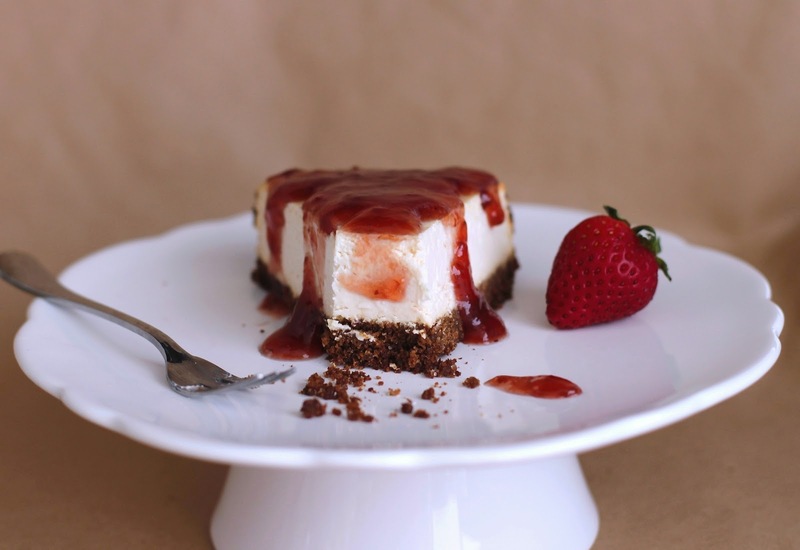 Remove the springform wall and let cool until barely warm, refrigerate overnight with a sheet of foil or paper towel draped over the cheesecake, not covered completely. The next day, dab the surface of the cheesecake with a paper towel to remove any moisture. 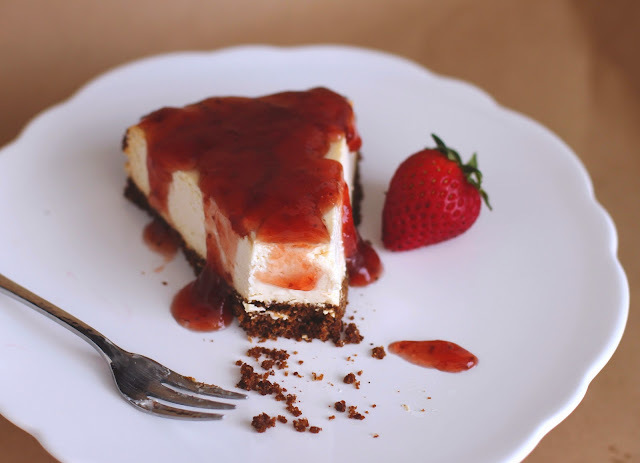 Slice and top each piece with ~2 tbs of the strawberry jam (or however much you like). 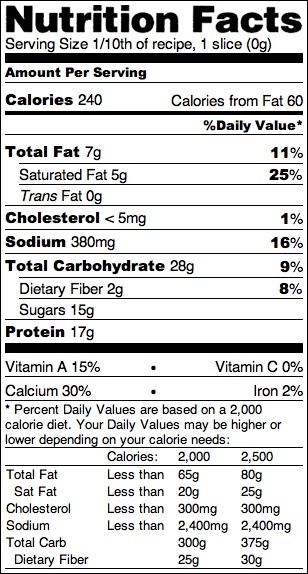 Get ready to see one astounding nutrition label, for one extraordinary cheesecake! Am I the only one who crapped their pants? 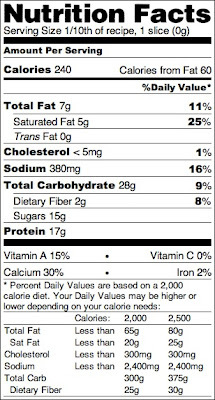 A hearty slice of cheesecake for 240 calories, 7g of fat and 17g of protein?!? I would recommend using the protein powder, since I've never tried this without it, but you can try doubling the arrowroot starch (to 32g or 1/4 cup) and add an egg (or 2 egg whites). Because the protein powder provides flavor and sweetness, you will need to increase the vanilla to 1 tsp and stevia to 3/4 tsp.